The program for the second International Ocean Colour Science (IOCS) meeting is now being finalized – see the Schedule at a Glance for details. The meeting will take place from 15 – 18 June 2015 in San Francisco, USA at the Marines’ Memorial Club & Hotel. The program will include seven keynote speakers, talks by space agency representatives on the status of existing and planned missions, a total of ten breakout sessions(in 3 parallel sessions) covering a range of topics, panel discussions, a comprehensive poster session to review the progress of ocean colour research, and a new event called Visions & Hallucinations – very short talks outlining highly innovative or provocative concepts in ocean colour science. We welcome submissions for this event. The annual NASA Ocean Color Research Team meeting (OCRT) will also be included in IOCS-2015 program, and a “West Coast Workshop” will take place after the conclusion of IOCS-2015. Registration (for all events) and abstract submission (for posters) is now open on the IOCS-2015 meeting website. Because of the limited number of students that could be accommodated at the 2014 Summer Lecture Series, arrangements were made for all the lectures to be video recorded. We are pleased to announce that these are now available from the UPMC website. The accompanying PowerPoint presentations for each lecture can be downloaded from the IOCCG website at: www.ioccg.org/training/lectures.html#SLS2014. These video recordings and accompanying PowerPoint presentations make for an excellent teaching resource. An extensive “red tide” type bloom of the non-toxic dinoflagellate Prorocentrum triestinum was recently detected in Elands Bay, in the Southern Benguela. 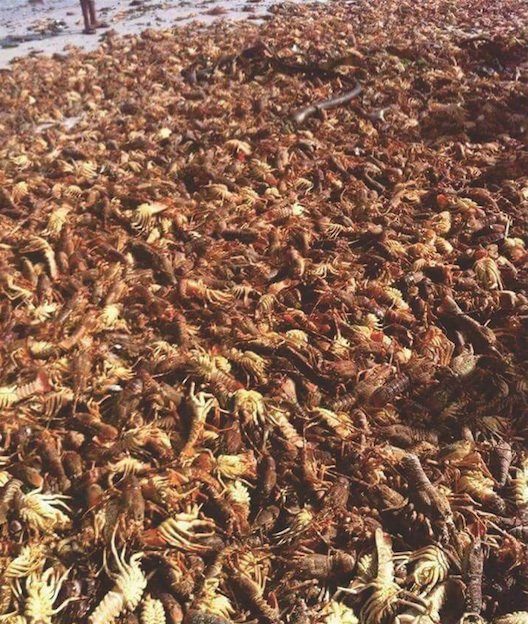 The bloom, resident for several weeks, and at one stage stretching along over 100 km of coastline, has caused extensive faunal mortalities due to oxygen depletion, including over 200 tons of West Coast rock lobster stranded at Elands Bay. West Coast rock lobster starved of oxygen. Click to enlarge. 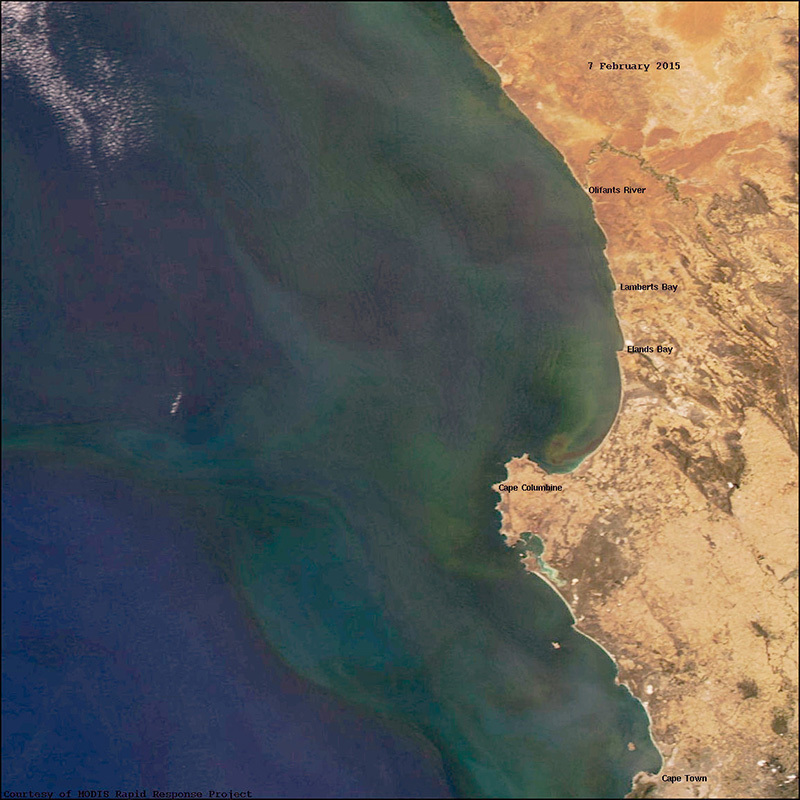 Whilst high biomass dinoflagellate blooms are not uncommon in the Southern Benguela, hypoxia related impacts of this magnitude occur much less frequently and this event is one of the largest in the last decade. Normalised fluorescence line height (right), showing the extensive Prorocentrum triestinum bloom (image courtesy of Christo Whittle, CSIR). A two-week summer satellite remote sensing training course (29 May – 12 June 2015, Cornell University, New York) is being offered once again to marine scientists who have modest or no prior experience with satellite remote sensing techniques. The course is highly methods-oriented and intended to give participants the practical skills needed to work independently to acquire, analyze and visualize large data sets derived from a wide range of ocean satellite sensors. Strong emphasis is given to ocean color remote sensing and the use of the latest version of NASA’s SeaDAS software to derive mapped imagery of a wide range of ocean color parameters (e.g., chlorophyll or CDOM) from raw SeaWiFS, MODIS, MERIS, VIIRS and HICO data. Pre-written python scripts will be used in conjunction with SeaDAS commands to batch process large quantities of ocean color data from Level-1 to Level-3. The course also addresses the use of previously processed satellite imagery for sea surface temperature, ocean wind speed and sea surface height. Finally, developing good basic Python programming skills that are needed for data analysis and visualization is a central component of this course. An intensive four-week, cross-disciplinary, graduate-level course in Optical Oceanography will be offered at the University of Maine’s Darling Marine Center from 6 – 31 July 2015. The major theme of the course is calibration and validation of ocean colour remote sensing. The course will provide students with a fundamental knowledge of ocean optics and optical sensor technology that will enable them to make quality measurements, be able to assess the uncertainties associated with the measurements, and compare these data with remotely sensed ocean color measurements and derived products. The course is sponsored by NASA and the University of Maine, with the goal of preparing a new generation of oceanographers trained in the use of optics to study the oceans. Methods for the assessment of satellite data products. Fundamentals of measurement theory are taken through to implementation of practical ground based radiometers and their application to validate satellite data used to generate climate data records. 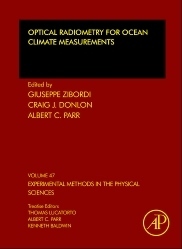 This book presents practical solutions for those involved or contemplating the validation of optical climate measurements from satellite instruments. For table of contents and excerpts click here. The dataset comprises the complete MERIS FRS Level-1 and Level-2 data archive from the Envisat mission spanning 17 May 2002 to 8 April 2012. MERIS FRS density maps are available providing an overview of the data coverage. With the delivery of this additional dataset, ESA is offering free access to nearly 340TB of Envisat MERIS Full and Reduced Resolution data for direct download online. For more details and data access, see the ESA announcement. ESA have been piecing together the many components that make up ESA’s Sentinel-3A satellite. In preparation of the launch on Rockot, the launch adapter was fit-checked successfully in December 2014 at the test center of Thales Alenia Space in Cannes. The purpose of this test was to check whether the mechanical interface between the spacecraft and adapter was performed correctly. After the fit-check, a separation test was also carried out to check proper behavior of the adapter separation mechanisms as well as to ensure that the shock loads arising during this test do not exceed the designed shock values. These important project milestones bring ESA one step closer to the launch of Sentinel-3A. The instruments on board Sentinel-3A will be able to provide a wealth of information about the Earth’s oceans and land, and the mission will play a key role as part of the space component of the European Copernicus programme. Sentinel-3 is particularly complex because it carries multiple instruments. 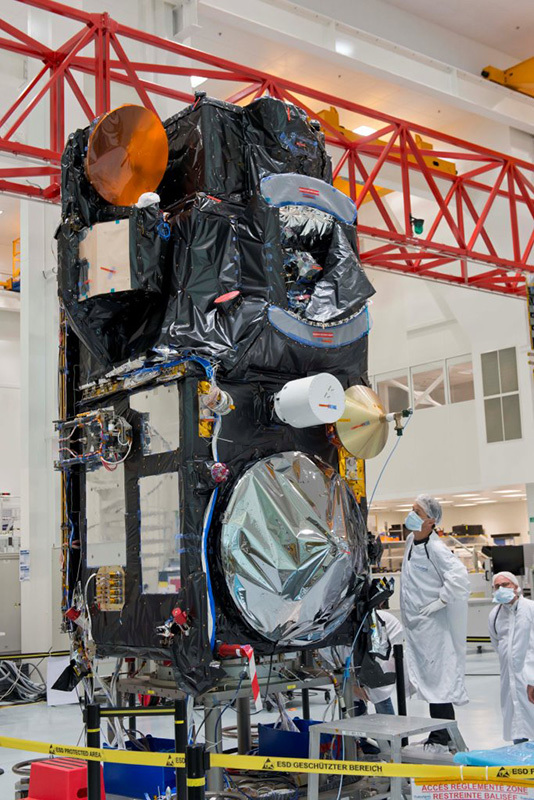 Construction of Sentinel-3B, which began in mid-2009, continues in parallel. This is an identical satellite, scheduled to be launched after 3A. Sentinel-3B will not replace its predecessor, but will be in orbit at the same time to improve the revisit time for the optical missions and, secondly, to ensure better coverage of the Earth. Both satellites are designed for a life time of 7 years. NASA’s Pre-Aerosol, Clouds, and Ecosystem (PACE) satellite mission is intended to be a hyperspectral ocean color mission that provides extended data record on ocean ecology and biogeochemistry. Recently, a competitively selected PACE Science Team was assembled to address science challenges pertaining to the PACE mission. One of the objectives of the PACE Science Team is to create a high quality, diverse and extensive database of existing multi- and hyperspectral inherent and apparent optical properties (IOP/AOP) data for the validation of remote sensing products and the development of algorithms for the PACE mission. Both polarized and non-polarized datasets are sought. This is a call to the community to contribute well-documented, quality controlled data sets consisting of synchronous IOP/AOP profiles and above-water radiometry that could be of interest in a global effort to build a database that would ultimately be published and made available to the public (estimated date of publication is 2017). All contributors to this database will actively take part in the quality assessment of the data and participate as co-authors on a publication that is expected to arise from this effort. Please direct any questions, recommendations or comments to Cecile S. Rousseaux (Cecile.S.Rousseaux@nasa.gov) and Emmanuel Boss (Emmanuel.Boss@maine.edu). Several new publications have been added to the IOCCG Recent References list including a paper by Kahru and Elmgren (2014) entitled Multidecadal time series of satellite-detected accumulations of cyanobacteria in the Baltic Sea. Cyanobacteria form extensive surface accumulations in the Baltic Sea in July and August, covering up to 200 000 km2. 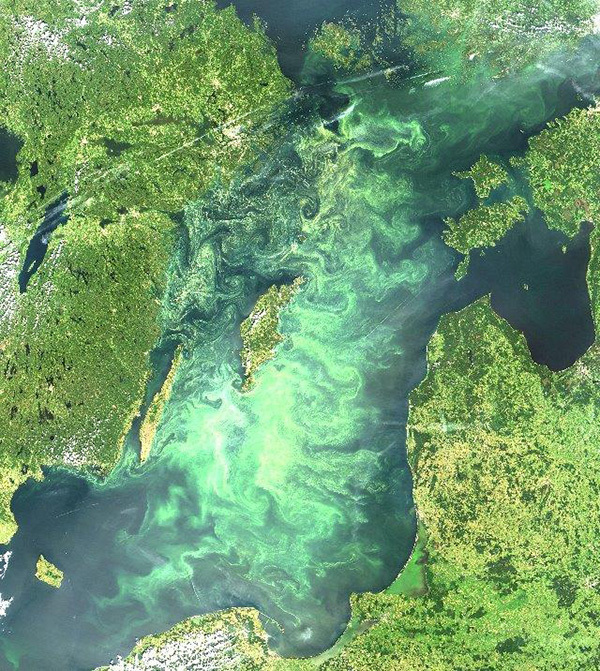 The authors constructed a 35-year time series of cyanobacteria blooms in the Baltic using various satellite data, which show that the timing of the cyanobacteria blooms has become progressively earlier (from around August, 8 to to July 19, i.e. almost 3 weeks) over the past 35 years. Cyanobacterial bloom in the Baltic Sea 11 July 2005 (MODIS-Terra data, after Kahru and Elmgren, 2014). Click to enlarge. Mikelsons et al. (2014) propose and demonstrate a new destriping algorithm for improved satellite-derived ocean colour product imagery. Detector-related striping noise can be removed from normalized water-leaving radiance spectra and the results show a significant improvement in image quality for both nLw(λ) spectra and nLw(λ)-derived ocean biological and biogeochemical products e.g., Chla and Kd(490). The destriping software package is available (click “Software Download”) at: www.star.nesdis.noaa.gov/sod/mecb/color/. 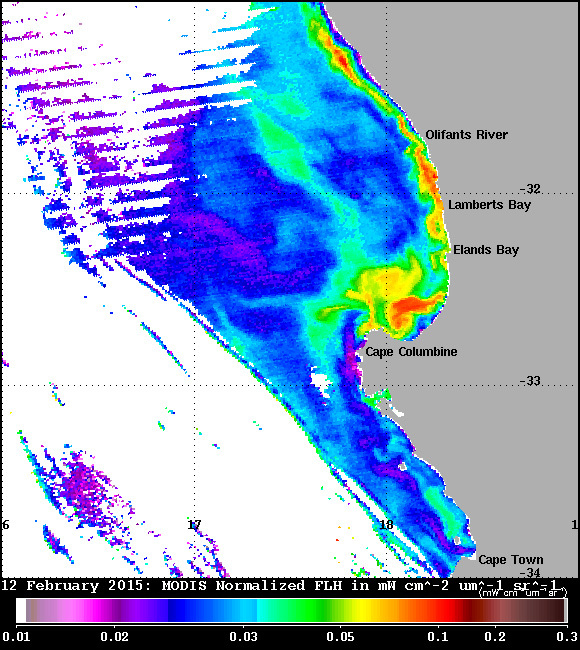 Destriping of nLw(λ)(412) obtained by MODIS-Aqua on 3 December 2013 (after Mikelsons et al., 2014). Click image to enlarge. Signorini et al. (2015) investigated chlorophyll variability in 5 subtropical oligotrophic ocean gyres using a merged SeaWiFS-MODIS/Aqua time-series of consistently processed ocean colour data to examine the expanding ocean gyres. The North Pacific, Indian Ocean, North Atlantic and South Atlantic gyres showed significant downward trends in Chl-a, while the South Pacific gyre has a much weaker upward trend with no statistical significance. Furthermore, time series of satellite-derived net primary production (NPP) showed downward trends for all the gyres. Mélin and Sclep (2015) present a new approach to perform band shifting applied to multi-spectral ocean remote sensing reflectance values in the visible spectral range. The band-shifting scheme aims at expressing RRS at a wavelength not originally part of the spectrum from data at neighboring bands. The scheme relies on the determination of IOPs by a bio-optical model, the calculation of the IOPs at the target wavelength using the spectral shapes assumed for each IOP, and the operation of the bio-optical model in forward mode to express RRS at the target wavelength. Lastly McKinna (2015) published a review on three decades of ocean-colour remote-sensing of Trichodesmium spp. in the World’s oceans. Trichodesmium-specific remote-sensing methods have been revised with improved knowledge of bio-optical properties and remote-sensing technologies. Planned next-generation sensors with higher spectral resolutions, in both low earth and geostationary orbits, are likely to enhance efforts to remotely-sense global Trichodesmium abundance. Several new employment positions have been posted on the IOCCG website including PhD positions at the University of Exeter and Plymouth Marine Laboratory (UK), Postdoctoral positions at NASA Goddard Space Flight Center, Oregon State University and CSIRO (Perth, Australia), Assistant Professorship at University of Arizona (USA) and Environmental data analyst for the BOUSSOLE bio-optics time series (France).